"The link's dead now, but there's no mistaking the appearance of a Zune HD 64 on the official Zune website. Hey Microsoft, got something you want to tell us?" Well, it's about time. Ever since the device launched in the fall, there have been rumors of a 64 GB model. 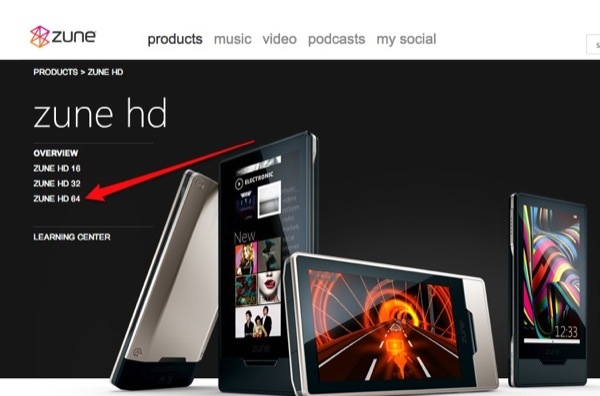 It looks like much of the speculation about it coming out in time for the spring update is proving true, as the Zune.net site showed a Zune HD 64 today. It was quickly taken down, but it's likely to be back up again soon when it's offically announced. I've been saying for months that I was going to hold off getting an HD until the 64 GB model came out. But now that Windows 7 is on the horizon, I'm considering just waiting for my next mobile phone upgrade. What do you all think?